REDDISH PURPLE: Aztec. Tlapali [Aztec word for "color" used for painting and drawing]. Old blood of prickly pear. The most alive and oldest. Brown: color of mole, of the leaf that goes. Earth. YELLOW: madness, sickness, fear. Part of the sun and of joy. COBALT BLUE: electricity and purity. Love. BLACK: nothing is black, really nothing. LEAF GREEN: leaves, sadness, science. The whole of Germany is this color. GREENISH YELLOW: more madness and mystery. All the phantoms wear Suits of this color... or at least underclothes. DARK GREENn: color of bad news and good business. navy blue: distance. Also tenderness can be this blue. magenta: Blood? Well, who knows! Yellow is "madness, sickness, fear." Several of Frida's 1940 paintings are dominated by a yellow that only exacerbates the dour mood. This yellow is not sunny, it is glaring. The yellow background in the Self-Portrait commissioned by the American engineer Sigmund Firestone, for example, makes Frida's black veil even more funereal. The yellow bedspread in The Dream is hallucinatory, and the yellow kitchen chair in the bleak Self-Portrait with Cropped Hair has the inappropriate gaiety of the yellow bed and chair in The Bedroom At Arles by Van Gogh. The darkness in the interstices of a wall of leaves in a nocturne entitled Self-Portrait with Monkey, 1940, seems a more straightforward expression of Frida's gloom. Here a blood-red ribbon braided through her hair winds around her neck four times and around her pet monkey's once. The mood is claustrophobic; beginning in the year of her divorce, Frida began to encircle her neck in self-portraits with ribbons, necklaces, veins, vines, or a monkey's long arms that threaten to choke her. 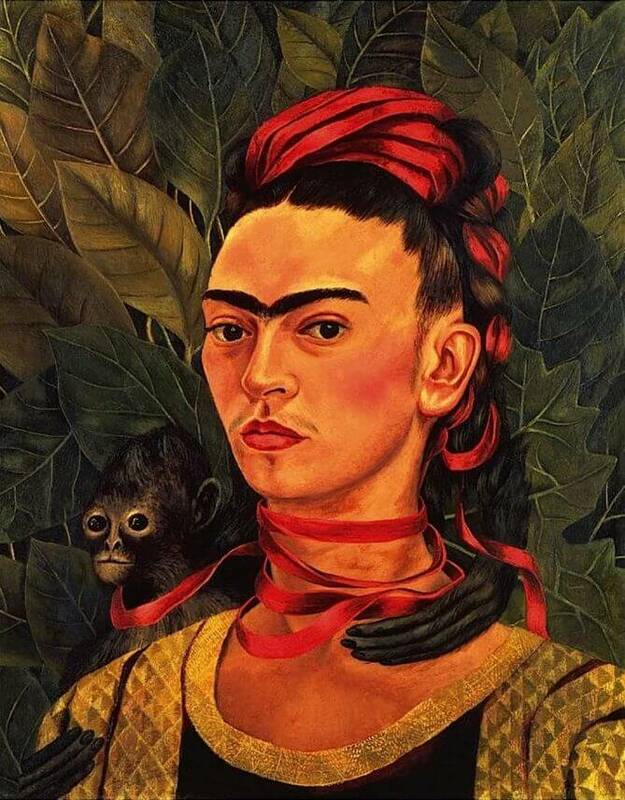 To identify the monkey as her close relative, Frida made his left arm continuous with her braid. Although she may have wanted to show her feeling of connectedness, the effect is sinister.